DO RARE vintage whiskies traded at auction represent a viable asset-class for the larger private investor? asks Leon Kuebler at WhiskyInvestDirect. In our previous article we looked at online whisky auctions, which account for the vast majority of lots of whisky auctioned in the United Kingdom. Although a good way to buy rarer bottles, especially of discontinued whisky, the majority of those sales occur at prices below £150, very much in line with current retail offers. That suggests the vast bulk of bids are made with drinking, not investing, in mind. Nor does there appear to have been a general upwards trend in the prices fetched at online whisky auctions over the last year. Any profits to be made have depended on investors picking individual "winners" that may go on to perform well at future auctions, rather than a generalized rise in the "asset class" overall. But what of more traditional auctions? 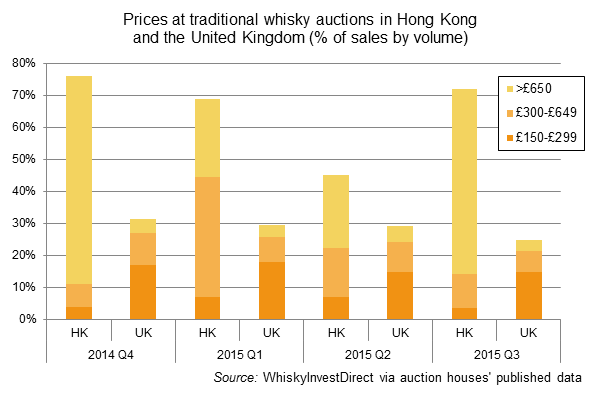 Media coverage of whisky auctions tends to focus on bricks-and-mortar auction houses, both in the United Kingdom and especially on the performance in Hong Kong of certain Japanese whiskies. 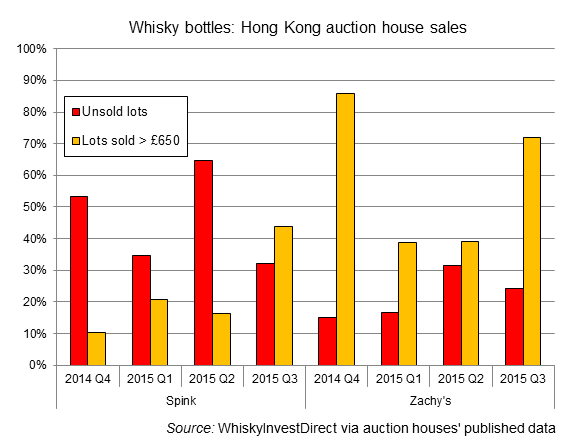 Perhaps that PR and media focus is unsurprising, because Hong Kong is where the most recent record auction prices for bottled whisky have all occurred. First, average prices are notably higher at traditional auctions than online. The median sale price over the period concerned – meaning the price at which half of all sales were higher, and half lower – was £132 in the United Kingdom samples. That represents a 71% premium over the average median online auction price of £77 in the UK over the same period. Hong Kong auction prices were much higher again, achieving a median £898 and giving a huge 1066% increase over UK online auctions' mid-range price. Second, looking at results from the four specific auction houses across the 12-month period under review, and disregarding the particular whisky brands offered at each event, the average sale price also showed a clearer upwards trend, again in contrast to UK auctions online. Between Q4 2014 and Q3 2015, Mulberry Bank (UK) reported sale prices declining 40%, but over the same timespan Spink & Son in Hong Kong saw an increase in the median price of 163%, while McTear's in the UK witnessed a rise of 73% and Zachy's (Hong Kong) saw growth of just above 10%. However, prices at traditional UK whisky auction houses do mirror one key feature at their online counterparts; namely, that only around 30% of lots auctioned achieved prices above £150 – a level below which the vast majority of bottles available at retail are priced. Hong Kong auctions, in contrast, showed fundamentally higher price brackets. An average 63% of lots auctioned fetched prices above the equivalent of £150 in the period concerned, the majority of which occurred above £300. At an individual level, Zachy's contributed a larger amount of ultra-premium prices (arbitrarily set at over £650), but the percentage of lots realising ultra-premium prices at Spink & Son increased by almost four-fold over the same period. As attractive as these figures appear on the surface, there are several crucial caveats to these results. Firstly, the sale of rare whisky through traditional auction houses incurs a high rate of commission, often reaching 20%. In the case of the record-breaking 52-year-old 1960 Karuizawa auctioned at Bonhams in August 2015, this premium was £14,099, or 18.4% of the sale price. Additional fees for delivery, tax and customs charged (particularly relevant in the case of Hong Kong) may also apply on top. Secondly, the median prices are calculated only for lots sold, and do not include lots which failed to meet their reserve. This is a crucial difference from the median lot auctioned, which was the figure listed for online auction houses in our revious article, as it represents the true "middle" of all lots, sold or unsold. The difference between median sale price and median auction price is relatively small for online auction sites, because they see high volumes with low levels of unmet reserves. 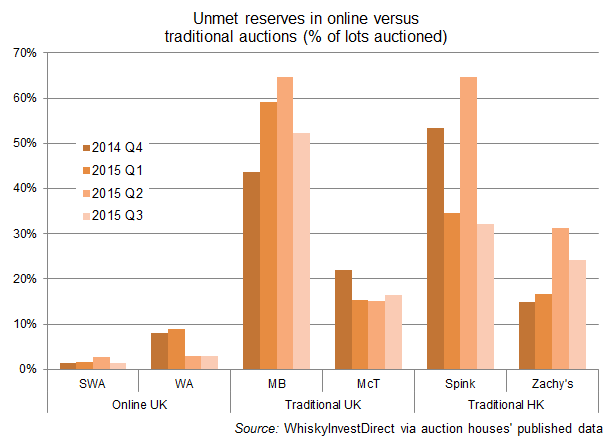 For example, of the two major UK online auction whisky sites, the auction with the highest rate of unmet reserves, Whisky Auctioneer's 2015 Q1 (March) auction, produced a median auction price of £99, whereas the median sale price was £110; a gap which, while not insignificant in percentage terms (10%), is nonetheless not huge in real terms. For traditional auction houses, where the volume of lots auctioned is smaller and the rate of unmet reserves is higher, the discrepancy is far greater. Indeed, the median lot auctioned for five of the sixteen auctions sampled, three in the United Kingdom and two in Hong Kong, was £0 (see below), as over 50% of lots auctioned were returned unsold. 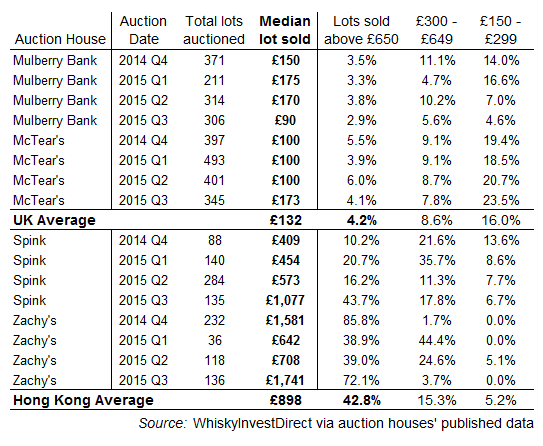 Auction results from Hong Kong also imply that there may be an inverse relationship between the percentage of lots sold for over £650 and those which do not meet their reserve. In general terms, most auctions in Hong Kong saw an increase in unsold lots when fewer lots exceeded £650, while a rise in lots over £650 was normally met with fewer lots failing to meet their reserve. The above results suggest that many higher-value whiskies are relatively illiquid assets. The illiquidity of such whiskies is heightened by the fact that whisky auctions held by traditional auction houses generally occur on a quarterly basis, as opposed to the monthly basis on which all major online auctioneers operate. McTear's, which holds a whisky auction every five weeks, is the exception in this regard; coincidentally, their average rate of unmet reserves over the auctions sampled, at 17.3%, was the lowest of the traditional auction houses studied. High rates of unmet reserves are not unique to rare whisky, but are common features of many luxury assets. For example, a classic car auction held by Bonhams UK in September achieved an unmet reserve rate of 18.9%, while another held by their Hong Kong branch in August held a rate of 13.5%. Fine art exhibits an even higher rate of unmet reserves, despite being one of the most developed antique markets. An auction of 'Fine Chinese Paintings' held in Bonhams Hong Kong in May returned 41.5% lots as unsold, while 'Scottish Art' fared slightly better in Bonhams Edinburgh four months later, with 30.92% of lots unsold. Nevertheless, the median lot auctioned for Scottish art was £1,875, while the median lot auctioned of classic cars in Hong Kong was £107,271. These figures comfortably dwarf those of the rare whisky auction market. Results in Hong Kong were further skewed by the strong results achieved by bottles from one source; Karuizawa, the closed Japanese distillery, whose remaining casks were bought in 2011 by the Number One Drinks Company, which has since released limited stock for sale, including 41 bottles of that 1960 spirit bottled in 2012. As the above data indicates, an average of 28.7% of lots auctioned in Hong Kong in the last two quarters was from Karuizawa distillery. By way of contrast, neither Mulberry Bank or McTear's had a single bottle of Karuizawa auctioned over the same period, while sales at the two major UK online auction rooms, Scotch Whisky Auctions and Whisky Auctioneer, saw only an average 1.2% of all lots come from the Karuizawa distillery in 2015 Q2-Q3. At each of the four Hong Kon auctions in the table above, the median sale price for Karuizawa was significantly higher than the overall median sale price of the entire event. Lots of Karuizawa were also disproportionately significant to prices over £650, as was the rate of Karuizawa bottles failing to sell. The impact of this one brand on Hong Kong's overall whisky auction phenomenon is plain. In the one sale where Karuizawa featured less heavily in the £650+ price range (Zachy's, 2015 Q2) the overall auction's median price suffered heavily. When the majority of Karuizawas failed to meet their reserves and went unsold (Spink & Son, 2015 Q2), the auction's median sale price was significantly lower again. This divide in the types of lots auctioned in Hong Kong and the United Kingdom is echoed elsewhere. Bonhams, for example, did not include a single bottle of Karuizawa in their June auction in Edinburgh. Yet 34% of the lots included in the August Bonhams Hong Kong auction were from Karuizawa, with 43% of all lots sold for prices above £650 originating from this one closed distillery. Overall, that meant 76% of lots sold at that Hong Kong event exceeded £650, whereas only 26% did at the Edinburgh sale. For new investors, this represents a considerable problem. The latest Karuizawa release cost £6,000 to the 45 individuals chosen by ballot. Shortages of older stock at operating Japanese distilleries have also caused some major distillers to implement significant reductions to existing super- and ultra-premium product lines. There are also indications that prices for at least some Karuizawa releases may now have topped, with an index of selected rarer bottlings plateauing since April after quadrupling inside two years. Bottom line? The performance of bottled whisky at traditional auction houses in the United Kingdom, while slightly better in median prices achieved, differentiates little from the UK online whisky market. Indeed, in liquidity and commission terms, it appears to be somewhat less attractive. Traditional auction houses in Hong Kong have returned far higher median sale prices, but they have also suffered from high levels of unmet reserves and also come with sizeable commission rates. Most notably, the heavy reliance of Hong Kong prices on Karuizawa's performance – and on Japanese whisky more generally – also suggests that the majority of large profits in this market are limited to a small substrata of rare whiskies, rather than the performance of the "rare bottles" category as a whole.